Ayloo et al (2013) report that 1-3% of annual visits to a primary care provider in the United States is related to chest pain while 20-30% of hospital admissions is for pain in this area. 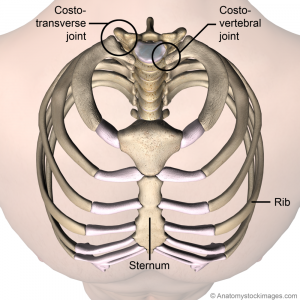 The sternum is a flat bone located in the center of the anterior thoracic wall. It consists of three segments; the manubrium (uppermost part), the body (middle part) and the xiphoid process (lowest part). The manubrium articulates with the clavicles, the first ribs and the superior part of the second costal cartilages. The manubrium is quadrangular and lies at the level of the 3rd and 4th thoracic vertebrae. The jugular (suprasternal) notch is the thickest part of the manubrium and is convex anteriorly and concave posteriorly. Myocarditis: Caused by infectious agents (e.g. viral) and non-infectious (e.g. lithium, cocaine). Fifty-two percent of cases occur in patients aged 20-39 years old. Symptoms may include chest pain, difficulty breathing, fatigue and palpitations. The patient may report recent flu-like symptoms. Pericarditis: Can be caused by infection, sarcoidosis, rheumatoid arthritis and systemic lupus erythematosus. Symptoms present as pleuritic chest pain which is improved by sitting forward and worse with lying down. Lower Respiratory Infections (e.g. bronchitis, influenza, pneumonia): Chest pain is caused by overuse of chest muscles with coughing or pleural inflammation. Return to intense physical activity should be done with caution to limit risk of complications; the patient should be afebrile and any residual symptoms should be above the neck. Gastroesophageal reflux disease (GERD): This presents as a burning pain behind the sternum and may occur with a asthma-like symptoms, dry cough and a sore throat. Referred pain from the esophagus: Esophageal spasm could be triggered by anxiety or drinking cold water. Boerhaave's Syndrome: This is a rare condition involving an esophageal rupture caused by a sudden increase in intraluminal pressure. Such a rise in pressure may occur as a result of heavy lifting, although a report exists of one case stemming from a spinal manipulation for back pain. Profound retching associated with alcoholism is also linked to this syndrome. Symptoms include pleuritic chest pain and painful swallowing. Stress fractures of the sternum This type of fracture represents 0.5% of all sternal fractures and is thought to be caused by repetitive contractions of muscles attaching to that bone. Documented cases include weight lifters, a golfer and military recruits performing tricep dips. Clavicle fractures These fractures account for 8-15% of all paediatric skeletal injuries and 2-5% of all fractures in adults. In adults, over 66% of fractures occur at the diaphysis of the clavicle while in children, up to 90% occur in the mid-shaft. Of all clavicle fractures, around 25% occur in the lateral third and 2-3% occur in the medial third. The most common mechanism of injury is a fall onto the arm when the arm is positioned beside the trunk, such as during contact sports. Stress fractures of the rib The ribs are affected by stress fractures less frequently than bones in the lower extremities. When they do occur, the mechanism typically involves prolonged activity-related fatigue of muscles involved in breathing and/or upper extremity movement, which then decreases the ability of the muscle to absorb and dissipate forces acting on the rib. The anterolateral aspect of the first rib is commonly affected by this condition in sports involving repetitive overhead activities (e.g. tennis, baseball, javelin, basketball and weightlifting). It is most susceptible because of a weakness caused by the groove for the subclavian artery and opposing forces of serratus anterior and the scalene muscles. Ribs 4-8 are commonly affected laterally or posterolaterally with activities such as canoeing, rowing, swimming, ballet, gymnastics and golf. The posteromedial aspect of the upper ribs can be affected with golf, particularly in inexperienced players who strike the ground more often, which creates a forceful traction on serratus anterior. Contributing factors include technique, equipment, training volume and gender (since rib stress fractures are more common in women). Repetitive coughing can also results in stress fractures of the ribs, typically the lateral or posterolateral aspect of ribs 4-8 due to the interplay between serratus anterior and external oblique. Joint Subluxations Costovertebral subluxation can occur with rowing, gymnastics, dancing and butterfly swimming and typically results in posterior pain at the levels of the 6th and 7th ribs. Sternoclavicular and sternocostal subluxations are less common and may be related to trauma or congenital hypermobility. Costochondritis An inflammatory condition affecting costochondral junctions or chondrosternal joints. In 90% of patients, more than one area is affected and the most commonly affected areas are the second to fifth junctions. Those affected are typically over the age of 40. Clinical signs include localized pain on palpation which may radiate on the chest wall. No swelling occurs with this condition. Recent illness involving coughing and recent strenuous exercise or upper extremity usage can cause this type of inflammation. It has been associated with specific movements in sports including rowing and volleyball. Tietze syndrome A rare inflammatory condition affecting a single costal cartilage (usually the second or third). Those affected are typically under the age of 40. Localized pain and swelling are found with this condition but no warmth or erythema. It can be caused by infection (particularly from chest wall trauma), neoplasms or rheumatological conditions. It is a diagnosis of exclusion and CT scanning should be considered to rule out differential diagnoses such as lymphoma or skin cancer, particularly if the symptoms of suspected Tietze syndrome are persistent. Fibromyalgia A rheumatological condition that can cause persistent and widespread pain including symmetrical tender points at the second costochondral junction as well as the neck, back hip and extremities. General myalgia Related to a history of chest trauma or recent onset of strenuous exercise to upper body (e.g. rowing). It may be bilateral and affecting multiple costochondral areas. Local muscle groups may also be tender to palpation. Xiphodynia (or painful/hypersensitive xiphoid syndrome) A condition involving referral of pain to the chest, abdomen, throat, arms and head from an irritated xiphoid process. While xiphodynia is usually insidious in nature, trauma may precipitate the syndrome. Acceleration/deceleration injuries, blunt trauma to the chest, unaccustomed heavy lifting and aerobics have been known to lead to the condition. This is a diagnosis of exclusion and serious pathologies should be ruled out before the diagnosis is made. It is typically managed using pain medication but in more persistent cases, corticosteroids or lidocaine may be injected and in the most severe cases, the xiphoid cartilage may be surgically excised. Pectoral muscle rupture A relative uncommon injury that mostly occurs in male athletes between 20 and 40 years of age. Strenuous athletic activity (e.g. football, water-skiing, wrestling) and weight-lifting (particularly the bench press) are the most common activities associated with this injury. Mechanisms of injury are forced abduction against resistance, involuntary contraction and severe traction on the arm. Steroid use may make the muscle more susceptible to rupture. Injuries to muscles other than pec+ (e.g. intercostals, serratus anterior, internal oblique, external oblique) Typically these strains occur acutely in response to trauma, overuse or when returning to activity after a period of rest. Precordial catch syndrome (Texidor’s Twinge) An uncommon paediatric condition featuring episodes of sharp stabbing pain usually in the region of the left parasternal region or the cardiac apex. The pain is typically provoked in slouched positions and is worsened by deep breathing. Episodes typically last from 30 seconds up to three minutes. The condition is thought to be related to spasm of the intercostal muscle(s) but no tenderness is noted on palpation. Management involves reassurance, postural education and pain control as needed. Slipping rib syndrome (aka clicking rib, 12th rib syndrome, rib-tip syndrome) A relatively rare paediatric condition in which hypermobility of a rib causes recurrent focal and unilateral chest pain. Pain referral into the back and a recurrent 'popping' sensation may also be reported. Laxity in the sternocostal, costochondral, costovertebral and/or costotransverse ligaments allow for increased mobility and susceptibility to trauma. The hypermobile rib may be able to migrate under the superior rib and can cause intercostal muscle strain, intercostal nerve irritation or sprain of the costal cartilage. In classic SRS, the 8th to 10th ribs are most commonly affected but a rarer variant affects the sternocostal cartilage of one of the 1st to 7th ribs. Pain is reproduced with movement that stresses the affected area as well as palpation and a "hooking" manoeuvre of the affected rib (hooking the fingers under the rib and pulling it anteriorly). Surgical excision of the affected costal cartilage and anterior rib end is reported to be a curative treatment. Non-invasive approaches for less severe presentations include reassurance, analgesics, taping and avoidance of provocative movements. A nerve block may also be considered. This condition is rare in adults but may be seen in athletes who perform repetitive trunk movements such as running and swimming. Osteomyelitis An inflammation due to infection of the bone or bone marrow. Osteomyelitis of the sternum is rare and may stem from cardiac surgery, immunodeficiency, chest trauma (e.g. compressions during CPR), IV drug use, tuberculosis or abscess, although some cases have no precipitating factor identified. Osteomyelitis of the rib is also rare (less than 1% of all osteomyelitis) and may stem from chest trauma, thoracic or breast surgery, pneumonia, empyema, immunosupression or fungal infections (which typically as part of multi-system disease in immunocompromised patients). Mastectomy and radiotherapy for cancer may increase the risk of any infection following breast implant surgery but specific rib osteomyelitis as a complication is extremely rare. Thoracic spine including thoracic disc herniation (which is rare given the relative immobility of this region), discitis or a lesion of the spinal cord or vertebral body (e.g. neoplasm). Drugs: chest pain has been associated with stimulants and steroids. Mondor Disease: Superficial phlebitis of the chest wall caused by physical strain e.g. upper body workout. 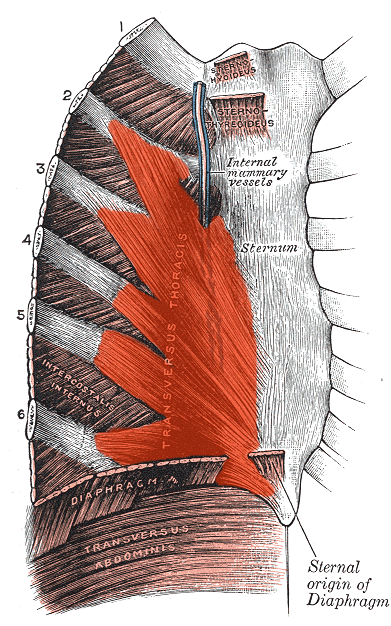 On examination, cord-like structures can be palpated over the chest wall. This condition typically resolves without treatment. Epidemic myalgia (aka pleurodynia or Bornholm disease): An acute viral illness affecting the pleura and intercostal muscles. Spontaneous pneumomediastinum: Patients present with subcutaneous emphysema and pain behind the sternum. Associated with sports such as scuba diving, swimming, rugby, volleyball, basketball, soccer and marathon running. Treated with oxygen and analgesia with full recovery within two weeks. The presentation of a patient with sternal pain depends on the specific cause of the pain. All patients presenting with chest pain should be screened for potential cardiac sources. A patient who is older than 35 years of age, has a history or risk of coronary artery disease or presents with cardiovascular symptoms should have electrocardiography and possibly a chest x-ray. Cardiac stress testing may also be required to fully rule in or rule out a cardiac dysfunction. A patient with fever, cough, chest wall swelling or other respiratory findings on history or examination should also have a chest x-ray. X-rays are also used to rule in/out fractures, as are bone scans (since x-rays are negative in 60% of all stress fractures). CT scans and MRIs may be indicated with suspected bony injury if further information is required. CT scans should be done when neoplasms are strongly suspected. Nuclear scintigraphy (organ scanning) may be positive with costochondritis but the test is not specific to that condition. Blood testing for rheumatoid factor and C-reactive protein (CRP) may be indicated if a rheumatological condition is suspected. Elevated white blood cell counts, fever, increased heart rate and increased respiratory rate are likely indicative of an infectious process. MRI is considered the gold standard for identifying osteomyelitis. MR imaging and/or ultrasound can help to assess the extent of a muscle rupture and if surgical repair is indicated. It is important that once a diagnosis of acute cardiopulmonary disease is ruled out, patients that presented in hospital with atypical chest pain are followed up with by health care professionals. Persistent pain, poor quality of life and inability to return to work are common in this cohort yet in a study published in 2003, the authors found that musculoskeletal diagnoses are most common when patients are reassessed one year following discharge without a diagnosis for their atypical chest pain. Similarly, Ayloo et al (2013) report that in patients presenting with chest pain to a primary care practitioner in the United States, 21-49% of diagnoses are musculoskeletal in nature. Further assessment and management are therefore important with these types of cases. Reassurance that life-threatening illness such as myocardial infarction has been ruled out is important to reduce the risk of persistent anxiety related to the chest pain. Chest pain persisting longer than 12 hours and tenderness on palpation of the anterior chest wall are strong clinical indicators of a musculoskeletal cause of sternal pain. 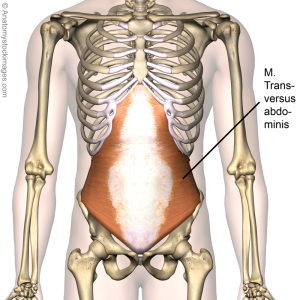 Active movements such as deep breathing (to expand the thorax) and elevation of the upper extremities may reinforce a musculoskeletal diagnosis. Pain during inspiration would be expected in the presence of a rib or sternal fracture, along with painful chest and upper extremity movements and pain on palpation and/or gentle percussion. If the fracture was a stress fracture, the pain might be difficult to localize at first but may become more prominent and debilitating over time. A bony callous may be palpated over the site of the injury with persistent stress fractures. In cases of tubercular osteomyelitis, a palpable abscess or discharging sinus may be observed in addition to chest pain and fever. Swelling from rib osteomyelitis typically occurs near the costochondral junction or the costovertebral angle. Resisted testing may pick up true muscular weakness or neurogenic weakness. Altered sensory testing and peripheral reflexes in addition to neurogenic weakness may be indicative of thoracic or lower cervical nerve root involvement. Questions regarding morning stiffness and other areas of pain or dysfunction as well as general observation of joints may raise the index of suspicion of a rheumatological cause. Asymmetry, swelling and bruising (either on the chest or into the axilla and arm) may be observed in the presence of severe muscle injuries such as a pectoralis major rupture and the patient may have felt a 'pop' at the moment of onset. Intercostal(s) Excessive exertion of untrained muscles in activities such as coughing, chopping wood or overhead painting and in sports with a lot of upper body exertion such as rowing. Pain/tenderness on palpation of intercostal(s). Pain with deep inspiration and coughing. Pectoralis major and/or minor Direct blow. Indirect trauma e.g. forceful eccentric contraction when muscle is already under full tension (more common in sports such as weight lifting and rugby), or forced abduction with external rotation or extension (such as in a fall or recreational weight-lifting). +/- Loss of axillary fold, asymmetry, palpable defect in muscle belly. Internal and External Oblique Muscle lengthening followed by sudden eccentric contraction. Uncommon injury but when present, typically associated with swimming, javelin throwing, rowing and ice hockey. It is also seen in the non-bowling arm of a cricket fast bowler. Pain on palpation of lower four costal cartilages. Increased pain with resisted trunk side bend towards the injured side. Serratus Anterior Overuse in activities such as weight lifting and rowing Pain at medial border of scapula radiating anteriorly. The management of a patient with sternal pain depends on the specific cause of the pain. In the presence of diagnosed joint inflammation, acetaminophen, NSAIDs, local steroid injections or topical analgesics may be indicated. Systemic arthropathies such as rheumatoid arthritis may require medications such as methotrexate while anti-depressants and pain medication such as gabapentin may be indicated for a diagnosis of fibromyalgia. Infectious processes such as osteomyelitis should be referred for appropriate medications such as antibiotics. Severe osteomyelitis may also require surgical debridement and treatment in a hyperbaric oxygen chamber. Rib fracture: Pain management (e.g. analgesics) and relative rest is recommended for the first three weeks post-injury followed by gradual return to activity (particularly overhead activities). Further investigation to rule out injury to underlying organs may be indicated, particularly in the presence of multiple rib fractures or single fractures to the 1st to 4th or 11th and 12th ribs. In cases of paediatric rib fractures, child abuse should be suspected because typical traumas that children undergo do not lead to this type of injury, thus appropriate referrals/notifications should be made. Clavicle fracture: Uncomplicated clavicle fractures in paediatric (i.e. skeletally immature) cases can be discharged after initial assessment, with instruction to wear a supportive sling or brace for comfort for 6-8 weeks. Adamich et al (2017) found that additional imaging after the initial assessment does not provide significant additional information such that it influence the decision-making process and that in the majority of cases, fracture shortening did not change significantly between the assessment and follow-up appointments. Even in cases of fracture comminution and displacement, additional visits and x-rays were found to be unnecessary because they did not change the management approach and nonunion did not occur, thus patients can be saved from unnecessary exposure to ionizing radiation, health care costs could be reduced and patients and their parents would not need to miss school and work to attend follow-up appointments. In more complicated cases (e.g. open fractures, refractures, neurovascular injury, fracture shortening greater than 2cm, fracture in medial third of clavicle, fracture in lateral third of clavicle with 100% displacement), referral to an orthopaedic surgeon is required for an individualized plan of care. However, van der Meijden et al (2012) note that fractures in the medial third are typically treated non-surgically with good outcomes and low rates of non-union but in the presence of displacement such that mediastinal structures are at risk, open reduction with plate fixation is likely required. Psychological management such as Cognitive Behavioural Therapy is indicated in the presence of anxiety and/or depression that may be magnifying pain and disability. Surgical repair is recommended for complete tears of pectoralis major unless a patient is older and/or sedentary such that a repaired muscle is not necessary for function of normal ADLs. Surgery is not typically indicated for proximal tears at the sternoclavicular origin or for partial tears. Repairs have been documented as long as 13 years following rupture with outcomes comparable to early repairs. Rib fracture: Pain management, deep breathing exercises to maintain appropriate lung function and relative rest for the first three weeks post-injury are recommended followed by gradual return to activity (particularly overhead activities). With stress fractures, correction of biomechanics and sport technique may be required to prevent recurrence. Delayed or malunion can occur but are typically asymptomatic. Joint subluxation: Conservative treatment involving pain management and joint manipulation. Surgical debridement may be considered if conservative treatment fails. Costochondritis: Reassurance, pain management, mobilization/manipulation and taping as appropriate. This condition typically resolves within one year. Muscle strain: Reassurance, pain control (e.g. analgesics, heat) and avoidance of aggravating activities as required in the acute stage. A progressive strengthening program and gradual return to activity in the subacute stage. Consider referral for injections of lidocaine or corticosteroids for persistent cases that do not respond to conservative treatment. Pectoralis major rupture: In the initial stage, a sling for comfort, analgesics and rest are required. Early shoulder mobilization and gentle stretching are also recommended. Once pain improves and mobility is back to normal (typically around six to eight weeks), strengthening can be added. Education on weight lifting techniques to reduce further stress on pectoralis major are also recommended (e.g. lowering the weight to no more than 4-6cm above chest wall, using a narrower grip no more than 1.5 times the biacromial width). Slipping Rib Syndrome: Typically treated with rest, physiotherapy and intercostal nerve blocks. If chronic and severe, surgical removal of the hypermobile cartilage segment may be performed. ↑ 1.00 1.01 1.02 1.03 1.04 1.05 1.06 1.07 1.08 1.09 1.10 1.11 1.12 1.13 1.14 1.15 1.16 1.17 1.18 1.19 1.20 1.21 1.22 1.23 1.24 1.25 1.26 1.27 1.28 1.29 1.30 1.31 1.32 1.33 1.34 1.35 1.36 Ayloo A, Cvengros T, Marella S. Evaluation and treatment of musculoskeletal chest pain. Prim Care. 2013 Dec;40(4):863-87. ↑ 2.00 2.01 2.02 2.03 2.04 2.05 2.06 2.07 2.08 2.09 2.10 2.11 2.12 2.13 2.14 2.15 2.16 2.17 2.18 2.19 2.20 2.21 2.22 2.23 2.24 2.25 2.26 2.27 2.28 2.29 2.30 2.31 2.32 2.33 2.34 2.35 2.36 2.37 2.38 2.39 2.40 2.41 2.42 2.43 2.44 2.45 2.46 2.47 2.48 2.49 2.50 2.51 2.52 2.53 2.54 2.55 2.56 2.57 2.58 2.59 2.60 2.61 Sik EC, Batt ME, Heslop LM. Atypical Chest Pain in Athletes. Curr Spor Med Rep. 2009;8(2):52-58. ↑ 3.0 3.1 3.2 3.3 3.4 Grant JCB. Grant's Atlas of Anatomy. 6th ed. Baltimore: The Williams and Wilkins Co; 1972. ↑ 5.0 5.1 5.2 5.3 5.4 5.5 Vacek TP, Rehman S, Yu S, Moza A, Assaly R. Another cause of chest pain: Staphylococcus aureus sternal osteomyelitis in an otherwise healthy adult. Int Med Case Rep J. 2014;7:133-7. ↑ 7.0 7.1 7.2 7.3 7.4 van der Meijden OA, Gaskill TR, Millett PJ. Treatment of clavicle fractures: current concepts review. J Shoulder Elbow Surg. 2012;21(3):423-9. ↑ Pecci M, Kreher J. Clavicle fractures. Am Fam Physician. 2008;77(1):65-70. ↑ 9.0 9.1 9.2 9.3 9.4 9.5 9.6 9.7 9.8 9.9 Connolly LP, Connolly SA. Rib stress fractures. Clin Nucl Med. 2004;29(10):614-6. ↑ 10.00 10.01 10.02 10.03 10.04 10.05 10.06 10.07 10.08 10.09 10.10 10.11 10.12 10.13 10.14 10.15 10.16 10.17 10.18 10.19 Proulx AM, Zryd TW. Costochondritis; diagnosis and treatment. Am Fam Physician. 2009;80(6):617-20. ↑ 11.0 11.1 11.2 11.3 11.4 11.5 11.6 11.7 How J, Volz G, Doe S, Heycock C, Hamilton J, Kelly C. The causes of musculoskeletal chest pain in patients admitted to hospital with suspected myocardial infarction. Eur J Intern Med. 2005;16(6):432-6. ↑ 12.0 12.1 Simpson JK, Hawken E. Xiphodynia: A diagnostic conundrum. Chiropr Osteopat. 2007, 15:13. ↑ 13.00 13.01 13.02 13.03 13.04 13.05 13.06 13.07 13.08 13.09 13.10 13.11 Petilon J, Carr DR, Sekiya JK, Unger DV. 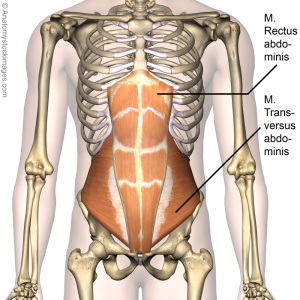 Pectoralis major muscle injuries: evaluation and management. J Am Acad Orthop Surg. 2005;13(1):59-68. ↑ Gumbiner CH. Precordial catch syndrome. South Med J. 2003;96(1):38-41. ↑ 16.0 16.1 16.2 16.3 Marcassa C, Faggiano P, Greco C, Ambrosetti M, Temporelli PL. A retrospective multicenter study on long-term prevalence of chronic pain after cardiac surgery. J Cardiovasc Med (Hagerstown). 2015;16(11):768-74. ↑ 17.0 17.1 17.2 Hetmann F, Kongsgaard UE, Sandvik L, Schou-Bredal I. Post-thoracotomy pain syndrome and sensory disturbances following thoracotomy at 6- and 12-month follow-ups. J Pain Res. 2017;10:663-668. ↑ 18.0 18.1 18.2 18.3 Springer JS, Karlsson P, Madsen CS, Johnsen B, Finnerup NB, Jensen TS, Nikolajsen L. Functional and structural assessment of patients with and without persistent pain after thoracotomy. Eur J Pain. 2017;21(2):238-249. ↑ 19.0 19.1 Kalso E, Mennander S, Tasmuth T, Nilsson E. Chronic post-sternotomy pain. Acta Anaesthesiol Scand. 2001;45(8):935-9. ↑ 21.0 21.1 21.2 Idrissa S, Tazi M, Cherrabi H, Souley A, Mahmoudi A, Elmadi A, Khattala K, Bouabdallah Y. Multifocal rib osteomyelitis in children: a case report and literature review. J Surg Case Rep. 2017 Jul 31;2017(7):rjx142. ↑ 23.0 23.1 Kashyap NK, Jindal A, Borkar NK, Wasnik M. Primary Tuberculotic Osteomyelitis of Rib in a Child. J Clin Diagn Res. 2017 Jul;11(7):PD08-PD09. ↑ 26.0 26.1 26.2 Spalding L, Reay E, Kelly C. Cause and outcome of atypical chest pain in patients admitted to hospital. J R Soc Med. 2003;96(3):122-5.